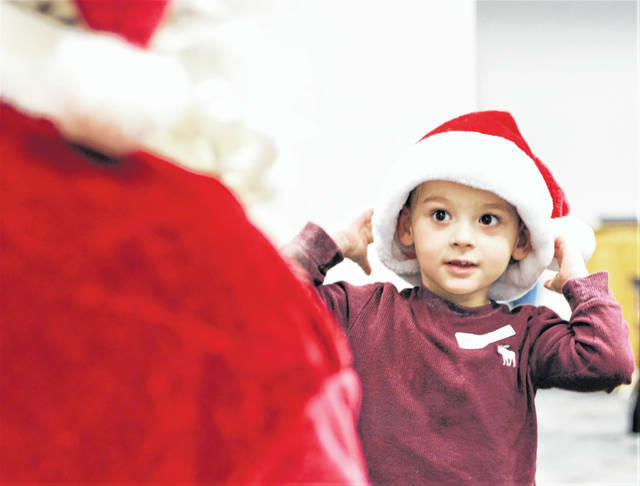 Waylon Dixon puts on his Christmas cap as he meets up with Santa Claus on Sunday morning at the Champaign County Community Center. 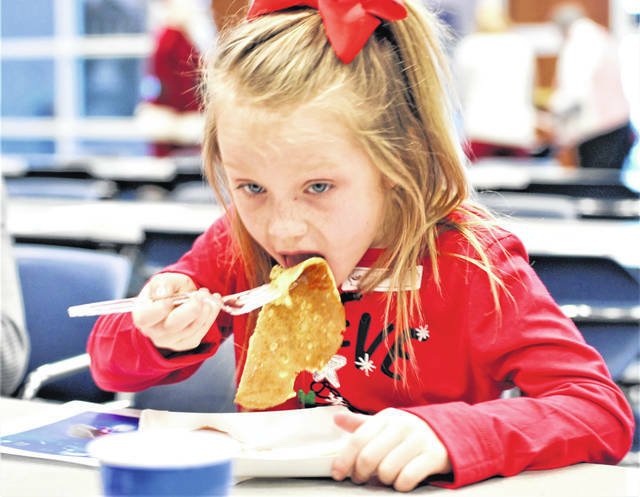 Landry McCulla chows down on pancakes during Breakfast with Santa at the Champaign County Community Center on Sunday. Urbana High School DECA students were in the holiday spirit, serving breakfast with Santa on Sunday. Pictured from left are Christian Dunham, Brandon Ebert, Gabe Johnson and Jacob Upchurch. 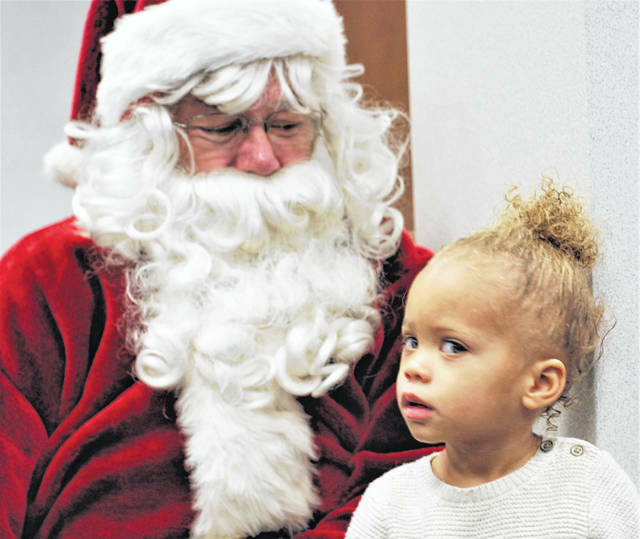 Serenity Shaw gives her family a wary eye as Santa Claus attempts to befriend her during Sunday’s breakfast event. Children whose names were drawn to have breakfast with Santa Claus gathered Sunday morning at the Champaign County Community Center auditorium. The 2018 Monument Square District Christmas festivities began the day after Thanksgiving with a Holiday Horse Parade and Santa’s arrival, during which children could enter their names to be drawn for participation in the breakfast. Frisch’s provided pancakes, sausage, juice and milk for the breakfast for 60 children and their families. 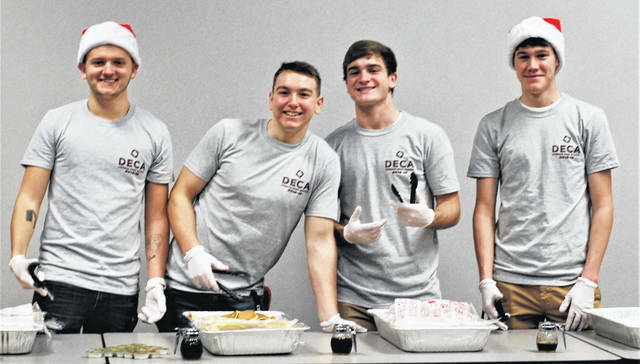 Urbana High School DECA students served the breakfast. Santaland is being hosted downtown this year by Oxner’s General Store, located in the southeast corner of Monument Square. Hours to visit Santa are Fridays from 5-8 p.m. and Saturdays from 11 a.m. to 2 p.m. There is still time to enter children’s names at Santaland for a special bicycle drawing. One boy’s and one girl’s bicycle will be given away courtesy of White’s Ford. Parents are encouraged to register their children for the drawing.